88.7 ml por envase - 30 envases. Forever Living Products has taken the best of drinks Pomesteen Aloe Vera Gel and Power, to combine into a functional single-dose foil pouch! 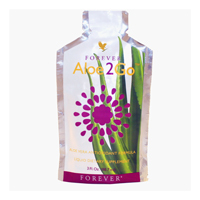 Aloe2Go Forever is a drink prepared to be taken at any place and at any time, in the office, the gym, in the car. Just take a container, open it and enjoy the benefits of these two nutritious drinks! Aloe2GoTM can provide a high level of energy that you need to provide your body with complex carbohydrates.